You can link by using the "External Accounts" button in your Navigation Tab (appears when you click on your username in the drop down menu). Click the "Associate with Discord" button in the "Discord Integration" section of the page. You will get redirected to the Discord Website where you get asked for a few permissions to access your information. This is said on the website already, but we will not get access to your account's password or other sensitive info. After accepting on the Discord Website, you will get redirected back to our Forum and asked to login again. 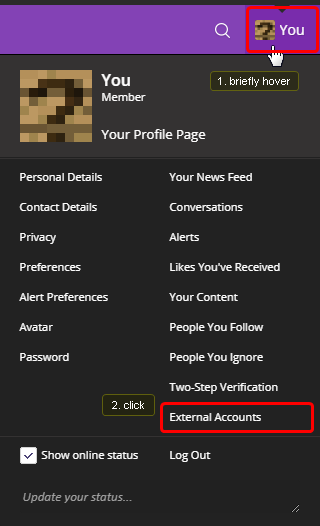 Your Discord Account should now be linked to your Forum Account (this should automatically change your Rank on our Discord Server to "Member"). Enter your Minecraft Username in the text window of the "Minecraft Integration" section and click on "Next". If you have a password already, enter it and confirm. You're synced now. If you have not done this before, create a MCAssoc Password and then you will be redirected to the Minecraft Website. Log into your account and just click the "change skin" button (This process adds a marker to your skin, that is not visible on the outside. This is an external service, so repeating this process on a different website will not overwrite your current link). You should be redirected back to the ShadowNode website. Your Minecraft Account is linked now. If you have not added a profile picture yet, our website will use the face of your skin by default. You can change it any time. If you encounter any issues during the linking process contact one of our staff members to solve it.